An ex-marine moves to Hong Kong to find his fortune, but finds crystal meth and the triad-run clubs of Wan Chai instead. I've been looking forward to this book since I first noticed it on the Blacksmith Books website, and I was not disappointed. Chris Thrall's memoir of the year he spent descending into drug-induced psychosis in the Hong Kong underbelly is a must-read for people who are interested in Hong Kong. He works as a bouncer for a series of nightclubs, slowly realizing that triads are in charge of everything. Thrall captures the energy and possibilities of Hong Kong even as he exposes its seedy, dangerous side. As a narrator, Thrall is likable and honest. He makes friends with everyone, whether or not they happen to speak English. He makes an effort to learn Cantonese and understand the culture, something that a surprising number of expats don't do. He meets a motley collection of expats and locals in Hong Kong, and he shows their characters through lively anecdotes and observations. His friends remind me of the diverse personalities I have encountered here in the last year. Thrall's writing style is active and approachable, and he relates his experiences with a lot of detail. I haven't read that many addiction memoirs, but Thrall does not wallow in the low points of this story. As he becomes increasingly paranoid and disconnected with reality, he writes with a curious, almost bemused tone. This allows a story that could be very dark to be accessible and enlightening. 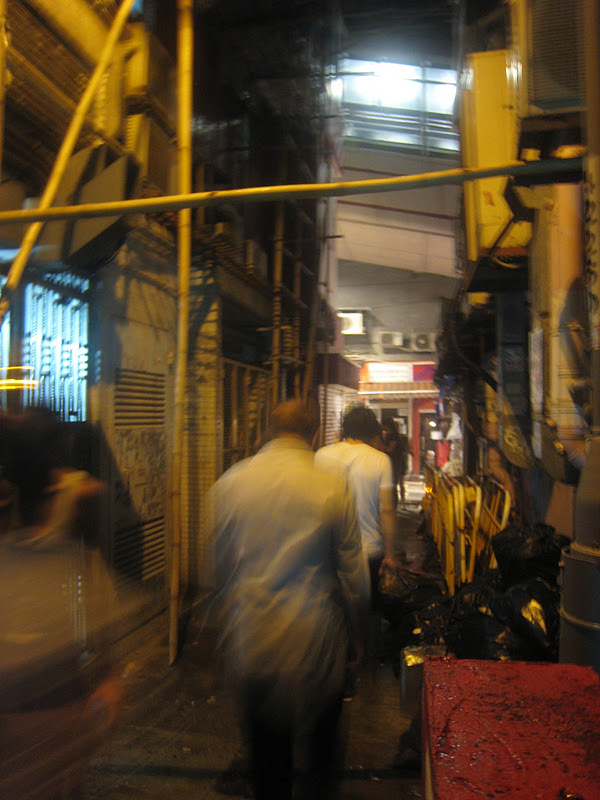 This is a well-crafted picture of the gangster-run nightclubs, revealing a side of Hong Kong that I have not experienced with fascinating clarity. Here's my walking tour of Wan Chai, in which I explore the area that is the backdrop for this book. I paid 138 Hong Kong dollars for the paperback. It is listed on Amazon for $12 US. There is currently no ebook version. What makes a narrator likable? Do you have to like the narrator in order to like a memoir? I love this review and am always curious what others think of books I've read and loved. I agree with everything you wrote and feel like I was in a similar position as a reader. Although I also lived in HK, so much of his experience was unique. That's why it was book-worthy material. As for your question, I think memoirs are different in that the character has to be likable for the book to succeed. In fiction I don't think that's always the case, but when someone writes a true story like this, it's hard to like the book if you don't sympathize with the writer. In Eating Smoke, I really liked Chris's character because he seemed like someone who got along with everyone, especially when he worked in the clubs. I also think that honesty really pays off in moires and as long as the narrator is honest, then the reader can't help but be sympathetic. Thanks Susan. I agree that honesty goes a long way in making a narrator likable. I think reading memoirs can be a good reminder to be sympathetic in general. Most people have something about them that you can relate to if you get to know them. In this case the narrator is easy to like. I bought this today at Swindon Books. So far I definitely DO NOT like the narrator, I've only read a little but I blame him for his circumstances; he was an easily led character even in the Marines, living a hedonistic lifestyle in between serving his country (BMW, Rolex watch, etc. )However his is a fascinating tale which I'm enjoying despite my dislike of him. I don't think it's necessary to like the narrator so long as they are compelling and fascinating. You might wonder what they are going to do next or think next. It's a rare author who can pull this off though. I'm glad you found my blog, yours is the first I've seen from HK, which has always sounded like a very interesting place to me. Sounds really interesting, I have learned with the pas of the years the art of the black smith, i live in japan right now, I have 10 years of tempering stuff like sword and some other goods and i can tell that i found my passion and all thanks to the books. Recently I bought a book Being stripped naked. This book is really very interesting. I have read one story from this book Initial weeks as an expat living in Hong Kong. I simply couldn’t stop reading it.